Thanking for explaining your process, down to pre-planning the colors and fonts. I especially enjoy seeing how you "got there" in a project. Your ancestors would be proud of the creative way you've told their stories. This was a great explanation of your process. 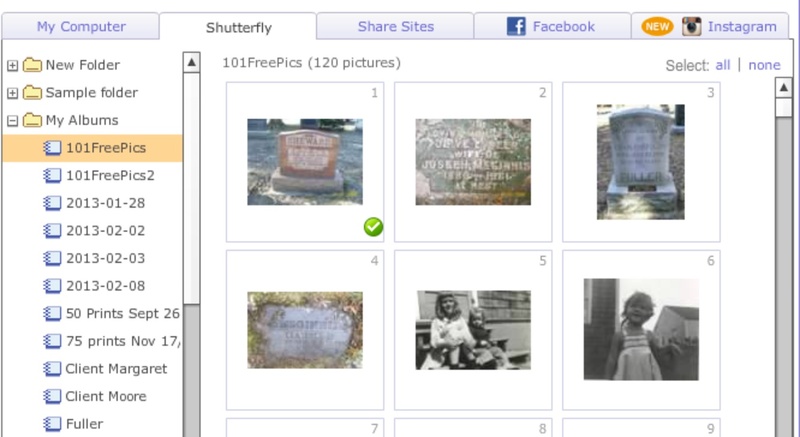 I have made many Shutterfly books over the years but none yet for family history research. They are in the future, I hope. I had not thought about doing several for each family line and so the process seemed really overwhelming. Now I just might be able to get things accomplished! Lynne that is exactly why I kept putting off getting my McGinnis and other family names done. I had so much information that it was overwhelming! Also the books got too big to be something that I thought family would even want to look at. Lorine, looks very attractive & easy to pick up and browse through. It is nice that you explained each step. I have done photo books through My Publisher of recent family events like weddings, holidays & trips. I will give your idea lots of thought for the future. Thanks for sharing. I've thought of doing this for a long time, but that perfectionism you talk about keeps getting in the way. Your husband was right on the mark. Thanks for the inspiration and the step-by-step process. This post will be my "how-to" manual when I start my own albums. I have used Shutterfly for 5 years, making family calendars at Christmas time and photo albums (with little stories attached) of grandchildren. I have been completely satisfied with the final product, and it was not as expensive as one might think. I've also spent hundreds of hours putting together "scrapbook type" history books, which have been costly and time-consuming. Thanks for sharing your experience about Shutterfly. I'm rethinking my ideas now about how to do family history books. Brilliant ideas, thanks. I too have been pondering how to begin "the book" of family. Now it seems more manageable. 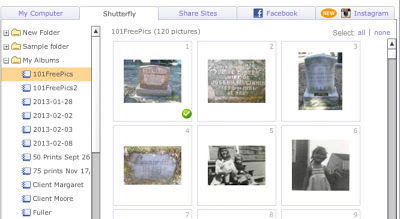 What made you choose Shutterfly over Ancestry? Shutterfly has much nicer templates and themes to choose from AND more importantly perhaps -- they will not create books that are being shipped to Canada. This is a wonderful idea! I actually tried it the first time last year, using Canada Photobooks as I had a Groupon coupon. I made a huge book for my Mom and she loved it, using her Grandparents on both sides of her family, and lots of lovely photos. It was such fun, I recently tried a Shutterfly book, similar to yours. I have to blog about it, as I just received it last week. I adore Shutterfly. I just found your website through searching for the 1921 Canada index so I'm now a follower. I love hearing that you've been creating books. Isn't it fun?? Glad you found my blog and thanks for following! I love this, Lynne! Thank you for leaving a comment about it on one of MediGroup's Google+ Discussions on scanning photos! This has been so helpful. Shutterfly makes great products and your books are beautiful. Your step-by-step is very, very helpful. This is great! I'm going to try to create a nice, short, family book about an immigrant family for an upcoming reunion. I really need to keep in mind to keep it SHORT! And, to not second guess my decisions! Thanks for the tips.